This past August, the Greater West Bloomfield Community Coalition invited Super Bowl champion linebacker Greg Jones to teach middle school students about leadership and character. Please click here to read the full article about this event. Oakland County Sheriff and Home Instead Senior Care have created Operation Medicine Cabinet, a safe and easy way to dispose of expired or no longer needed prescription drugs. Click here for drop off locations and times in our community. Every little action counts! Being a parent is more than being your children’s friend. You are your children’s first line of defense against the dangers of drug and alcohol use, and the first resource they have to learn the tools to resist dangerous choices. The following are resources and strategies you can use to deter your children from using drugs and alcohol, ensure that they are in safe and secure environments, and give them the skills to handle challenging situations. Monitor teens while they are in your home. Set a curfew and consistently enforce house rules. Inquire of another parent about a gathering or party to verify safe situations and supervised homes. Welcome telephone calls at your home verifying supervision of gatherings at your own home. Check amount and levels of open alcohol beverages in your home. Talk to your teen daily. Attempt to meet your child’s friends and their parents as their environment changes. Call authorities or other parents to report unsafe situations, parties or gatherings. Help your child figure out how to handle risky situations with a plan of action. A mother expresses her concerns about the future problems her child would be facing as an average American teenager. ROSWELL, Ga. – Police in metro Atlanta say a potent new drug that looks like lip balm is exploding in popularity. Oakland County Prosecutor Jessica Cooper visited OLMS and Abbott Middle Schools and facilitated a presentation about Internet safety to all of our grade levels. 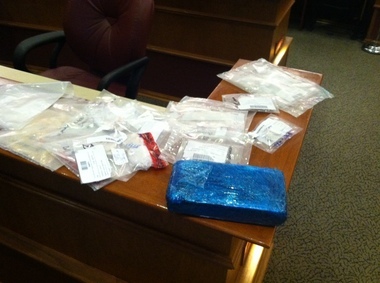 Heroin seized from the streets of Oakland County. PONTIAC, MI — If you don’t think there’s a heroin epidemic, a 26-year Oakland County Sheriff’s Department narcotics detective says you better dig a bigger and bury your head even deeper. “If you think for one second this isn’t a real deal,” said the undercover officer whose identity was withheld, “it’s knocking on your door. A new survey reports that 1 in 4 teens have misused or abused a prescription drug at least once. Click here to read survey results from youth and their use of prescription drugs.